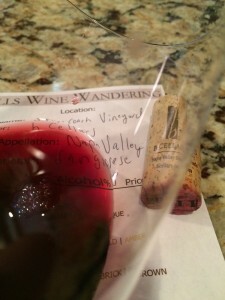 As I write this blog, there are only two remaining CellarPassTV episodes left this year. The October 29th episode – Hall – St. Helena Interactive Wine tasting and November 14th – a special Napa Valley Film Festival broadcast. 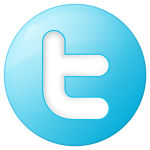 I have enjoyed participating and tweeting during the live episodes and I hope Cellarpass.com has enjoyed my presence. I look forward next year when the show starts airing again. 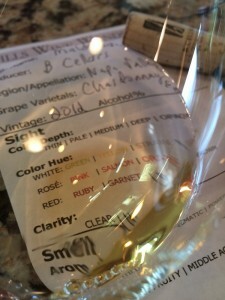 During this episode we were given three wines to evaluation. There must have been a mix up because the bloggers were given a Maldonado Vineyards Chardonnay; while on the show the first wine was a Rose. The other two wines were a Syrah and Sangiovese from the Stage Coach Vineyards. A note from the Stage Coach Vineyard Website: In recent years, Stagecoach Vineyard has become one of the most renowned vineyards in Napa Valley. 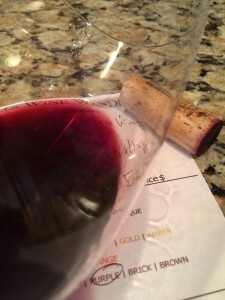 It rises 900 feet above sea level and continues to climb to nearly 1,850 feet at its highest elevations on the southern side of the Oakville appellation’s Pritchard Hill. Blessed with south-facing slopes filled with shallow, volcanic soils, the site’s rugged terroir is ideal for growing intensely colored Cabernet Sauvignon and Syrah grapes rich with mineral and mountain flavors. Ten additional grape varieties are planted on the hillside, each ideally suited to drawing the most flavor, structure and concentration from its soil set and climate. Most Krupp Brothers wines are exclusively sourced from Stagecoach Vineyard. A note from the Maldonado Vineyards Website: The vineyard is a 10-acre rectangle, planted in the dark, gravelly clay characteristic of Carneros and surrounding areas whose soil originated in the ancient reaches of the San Pablo Bay. The planting is dense, with the cordons close to the soil for warmth; a high canopy to catch as much of the sun as possible in this cool, misty canyon. The vineyard has a tiny half-acre secret garden across the creek that marks the southern border for the vineyard. The vines here are planted in meter by meter spacing; they are so stressed by their density that each vine produces only a few clusters, each nearly painfully intense in flavor. Besides selling grapes, both vineyards produce their own wine. Products were provided for free however the review is my honest opinion. Very aromatic, fruity-young with aromas of creamy-buttery, lemon, vanilla, and tropical fruit. Dry, full-bodied with good acidity. 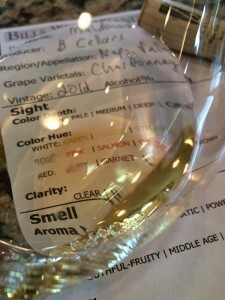 Creamy mid-palate flavors and I found the Chardonnay was better a room temperature. Only 425 cases produced. 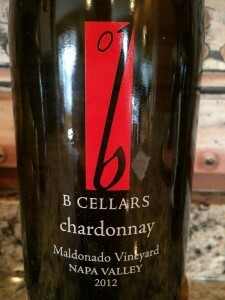 I rated the 2012 BCellars Maldonado Vineyards Chardonnay three glasses. The wine pairs well with Margherita Salami. Medium color depth with purple hue. Aromatic, with aromas of spice, cocoa, earthy, and plumb. Dry, medium-bodied with balanced acidity. Tannins were medium and soft and the flavor intensity was medium (not flavorful) with deep mid-palate flavors and a long finish. 100% Syrah and 150 cases produced. This was not one of Chris’ favorites, but I thought it was pretty decent. 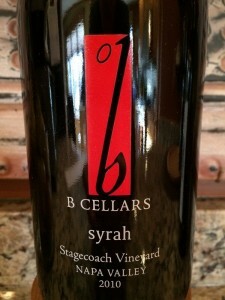 I rated the 2010 BCellars Stage Coach Vineyards Syrah two glasses. Moderate aromas of spice, red-cherry, slight cocoa. Dry, medium-bodied with balanced acidity. The flavor intensity was medium (not flavorful) with a dry mid-palate flavors and a long finish. Only 275 cases produced. 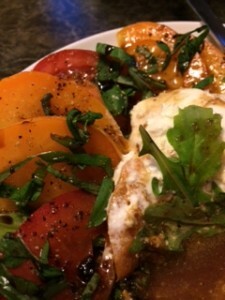 The Sangiovese paired will with a burrada tomato caprese salad. 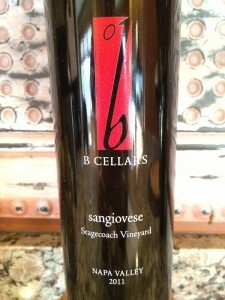 I rated the 2011 BCellars Stage Coach Vineyards Sangiovese two glasses.